← why is style violent? Now that I’ve confessed to having a favorite painter, I’m dangerously close to confessing that I also have a favorite novelist. If I did, it might be David Mitchell, twice shortlisted for the Booker Prize (though inexplicably not a winner). 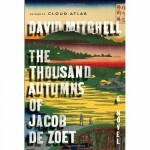 I was excited to hear that he’d put out a new book, The Thousand Autumns of Jacob de Zoet, and ripped through this one. It’s expectedly spectacular. Like its predecessors, it creates, explodes, and transcends style. It’s not “a” anything. 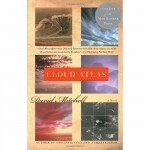 Mitchell’s soaring use of language makes you want to read aloud, just to enjoy the raw sounds. He has a wonderful sense of structure across scales– of the novel as a whole, of the sections, of the scenes, of the dialog, and even of the counterpoint between phrases. Do we pay for this standard of art with a tedious read?– no. The characters are brilliantly rendered, the scenery meticulous, the story propulsive. It’s a book to keep you up late. One reviewer described Cloud Atlas (which still remains my favorite of his books) as a “perpetual dream machine“, a characterization I agree with, and one which I think describes his work as a whole. That reviewer also apparently clung to a branch, keeping his distance artistically and emotionally, refusing to be swept along and over the falls. Mitchell’s books seem to have all met mixed critical reception, sometimes characterized as “genius”, sometimes as “unreadable”. I find the negative reviews hard to understand, as the joy in Mitchell’s writing is so utterly infectious, and the narrative force so powerful. He tells a damn good story. So Harry Mount, Paul Constant, I must conclude that you and your ilk have tin ears, or suffer from a failure to delight in narrative. Why are you reviewing fiction then?